A massive global ransomware attack has struck hospitals, companies and government offices around the world, seizing control of affected computers until the victims pay a ransom. Majority of the attacks have targeted organizations across world and India was among the 99 countries affected. 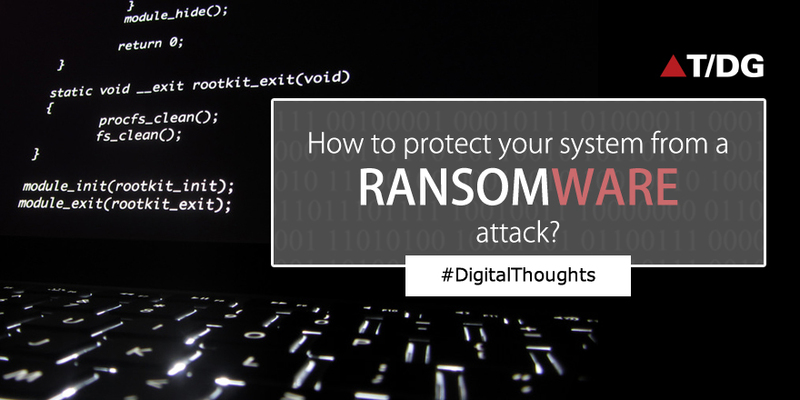 Ransomware is a malicious software that cybercriminals use to hold your computer or computer files for ransom, demanding payment from you to get them back. Sadly, ransomware is becoming an increasingly popular way for malware authors to extort money from companies and consumers alike. There are a variety of ransomware that can get onto a person’s machine, but as always, those techniques either boil down to social engineering tactics or using software vulnerabilities to silently install on a victim’s machine. The ransomware, called WannaCrypt or WannaCry locks down all the files on an infected computer and asks the computer's users to pay to regain control of them. T/DG have necessary controls in place and no incidents have been reported as of now. However, it is the responsibility of every computer user to follow some good practices and be the strongest link in our Cyber defense to avoid any potential risk. Refrain from opening attachments that look suspicious and/or received from unknowns. Think twice before clicking on dangerous hyperlinks received via social networks or instant messengers where the senders are likely to be people you trust, including your friends or colleagues. For this attack to be deployed, cybercriminals compromise their accounts and submit bad links to as many people as possible. Patch and keep your operating system, antivirus, browsers, Adobe Flash Player, Java, and other software up to date. Reboot your systems as soon as you get a notification from your Internet Security officers after the patches are deployed. Users working remotely need to ensure they have updated such patches. In the event of a suspicious process spotted on your computer, instantly turn off the Internet connection. Use strong passwords that cannot be brute forced by remote criminals. Set unique passwords for different accounts to reduce the potential risk. Make sure you disable file sharing. This way, if you happen to get hit, the ransomware infection will stay isolated to your machine only. Switch off unused wireless connections, such as Bluetooth or infrared ports. There may be a possibility of your Bluetooth getting exploited for stealthily compromising your machine. Strictly do not download any software. Outdated OS like Windows XP and Windows 2003 are highly vulnerable to this Ransomware. Please do not use these OS in your environment. Since ransomware is definitely today’s number one cyber peril due to the damage it causes and the prevalence factor, the countermeasures mentioned above are a must.